20th Century Fox releases Percy Jackson: Sea of Monsters nationwide on August 7th, 2013. NYC MOVIE GURU: How challenging was it to pay attention to the human elements of the film between all of the action? Logan Lerman: That's hard. It's a little bit of my job. I get the script and think to myself, "How do ground it a little bit from what was given to me?" . 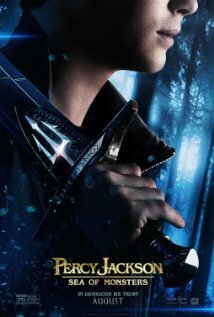 NYC MOVIE GURU: What's the main difference between this installment of Percy Jackson and the first one? LL: This is definitely a lighter film than the first one. I was always trying to find the middle ground. I didn't get a day off. Any break that we got we'd be training for the next fight sequence. We'd start off at like 5 or 7 AM. Friday there'd be a night shoot and then Saturday we'd end at 5 AM and then I'd go on a plan to meet Darren Aronofsky to audition for Noah. This happened within a week and a half. Then I flew back on Sunday night to go back to work on Percy Jackson. There was just no sleep because there wasn't a day that I wasn't working on this film. It was more exhausting; there was definitely more room for me in the 1st film to catch a breath at time. NYC MOVIE GURU: Do you perceive Percy Jackson as a superhero? LL: I guess he is a superhero in a way, but he's human. That's what makes him relatable and why these films are interesting for young people. He's insecure and has a lot of self-doubt in this movie, which I think everyone deals with at some point for teenagers. NYC MOVIE GURU: How did The Perks of Being a Wallflower? affect your career so far? LL: It opened up a lot of doors for me to work with filmmakers that I appreciate. It's been a nice stepping stone and got Darren Aronofsky's attention to cast me as Noah's son in the upcoming Noah. That was a dream because I'm a big fan of Darren Aronofsky. NYC MOVIE GURU: What made you decide to become an actor? LL: We're all products of where we're from. I'm from Los Angeles and the only culture there is Hollywood. That's all we have. That probably had an influence on why I love movies so much. NYC MOVIE GURU: How do you feel about the physical training for the action scenes? LL: I enjoy it, but it's physically tiring. I can't imagine going from one action film to another. I'm not that kind of actor. LL: It's just more interesting to me. Instead of just cookie-cutter characters, I characters that have darkness.